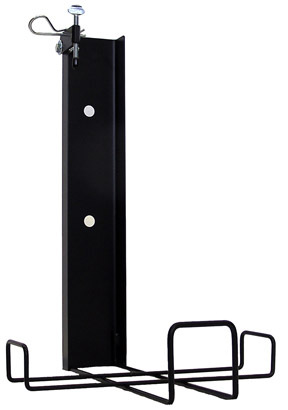 Mount your 5 Gallon Spill Kit on a vehicle or wall with this steel bracket. When space is limited, use this steel bracket to hang your 5 Gallon Pail Spill Kit on a truck, equipment, or wall. Bracket is manufactured from heavy duty steel and wire, then powder coated in matte black for a corrosion resistant finish. Securely mount the 5 Gallon Spill Kit anywhere a spill is likely to occur. **This bracket works with EnviroMet's Tear-Tab Lid Spill Kit, but not with the Screw Top Lid Spill Kit. Shipping rates are estimates only, and do not include fuel surcharges that change daily. Actual rate may vary.